Thursday began with the first day of a Transition Thrive training, and Friday featured the second day of that training, attended by 35 people from around the world, as well as a Youth Symposium and the REconomy Day. I arrived on Friday lunchtime, gave a short talk for the Youth event, and dipped into the REconomy day, so I can’t say much about either. Fortunately, thanks to the various people who documented the event, you can see some great photos of the REconomy day here and read Jay Tompt’s reflections on it here, and here Caroline Jackson reflects on the Youth day. Both events brought a very welcome input of different kinds of energy to Transition, having more young people around was wonderful, and the focus and economic practicality of the REconomy day, especially, according to many of the people I spoke to, the session in the morning where a series of people gave 7 minute talks about their social enterprises, were amazing to see (I was already seeing people on Twitter raving about it before I even reached London!). 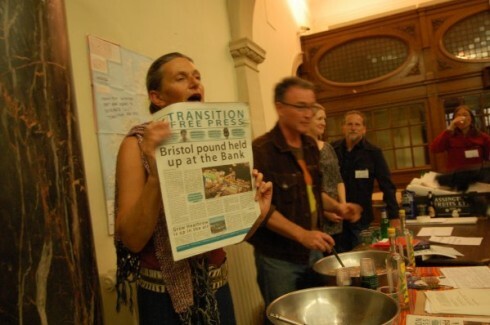 The other key event of Friday was, at 7pm, the official launch of Transition Free Press, the new quarterly newspaper for the Transition movement. All the team behind bringing it into the world were there, and speeches and celebration marked its emergence, with a great deal of cheering, applause and back slapping. There was even some home made herbal cordial stuff, a kind of hedgerow Pimms, which went down very easily. Peter Lipman welcomes people to the conference. 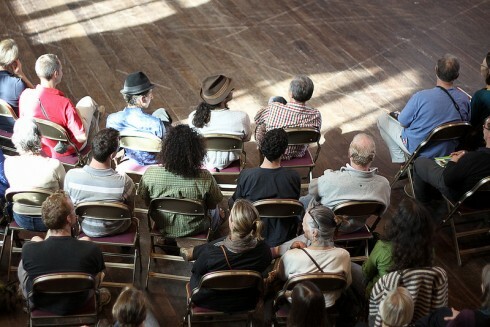 “As soon as the Saturday sessions of the Transition Conference 2012 start, you can tell that this is not just any old conference. It sounds and feels different, it looks different. People are welcomed with the suggestion that they take a moment or two to fully arrive, have a few deep breaths and focus on the reason they are there”. Various mappings were done, and it emerged that around half of those attending were from outside the UK, a first for these conferences. Friday evening ended in the bar, with anticipation high for the following day. Here are Mike Grenville’s photos of the day. Saturday began with people forming into ‘Home Groups’, groups of 4 people who would meet back up with each other regularly during the event and this then led into an explanation of how Open Space works and an invitation for people to put forward topics for discussion in that forum. 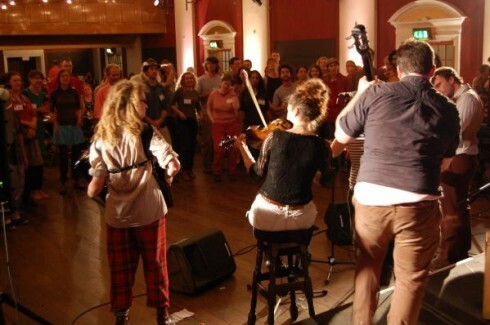 The usual flurry of writing and suggestions produced a huge number of suggestions, which were, during the following sessions, collated into the number of conversations the timetable (and the venue) could accommodate. Yes, it’s that annual impossible decision, which workshop to go to? Then it was off to the first round of workshops. Some of those on offer included communicating Transition beyond ‘the usual suspects’(which Jay Tompt has blogged about here), Playing for Time, which looked at the role of the arts in Transition, local currencies including the about-to-be-launched Bristol Pound, and Sophy Banks on how to make a happy, healthy, human culture and why sometimes we don’t (you can hear the audio from that workshop here). The workshop on local currencies. 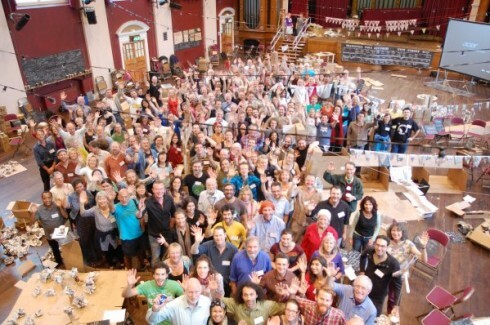 You can hear the audio from the ‘Power to the People’ workshop which looked at community energy companies here. Social reporter Kerry Lane went to Sue Milner and Iona Fredenburgh’s workshop on conflict, and blogged about it here. 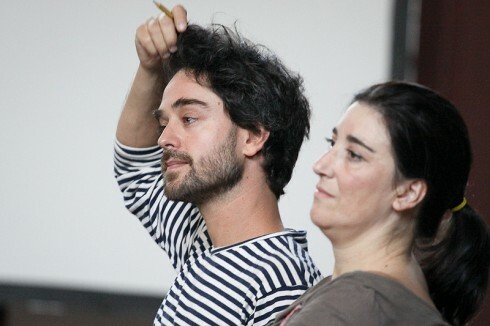 Juan del Rio and Filipa Pimentel at the workshop on Transition and austerity. I chaired a workshop called ‘Should we be reshaping Transition for times of austerity’, with Filipa Pimentel and Juan del Rio. It was a fascinating conversation, which you can hear in full here, and which raised fascinating questions and discussion about Transition and how it might look in differing economic conditions. After lunch it was time for Open Space. The diversity of topics for discussion was, as usual, eye watering. 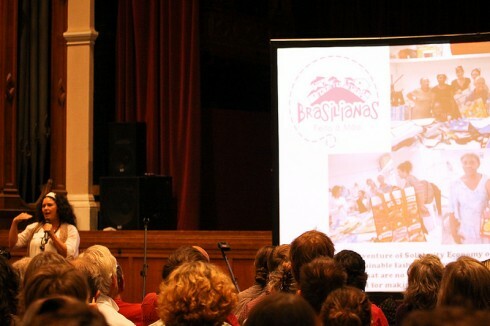 Social reporter Ann Owen blogged about one she attended on how the concept of the Gift Economy can be balanced with the need for jobs. I had to pop off during the Open Space to do a questions and answers session via Skype to TEDx Madrid, with Juan del Rio, which went really well and which I’ll post the video for as soon as it has been posted online. Presenting to TEDx Madrid from one of BAC’s bedrooms. 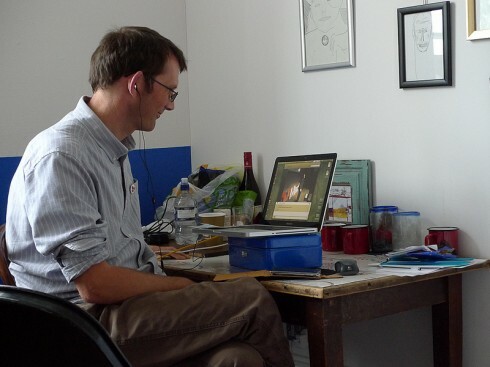 Caroline Jackson went to the workshop on mentoring for Transition, and blogged about it here. People then wandered off for some down time, either games on Clapham Common, sitting in the sun on the front steps of BAC, or wherever their feet took them, and enjoyed slices of the warm sourdough bread that had just emerged from the baking workshop. At 8pm everyone reconvened for the evening’s cabaret. Hosted by Matt Harvey, the evening featured poets, writers and music, concluding with a rather wonderful band, who weren’t the one we were expecting (I still keep expecting to hear that they have been found bound and gagged in a cupboard at BAC) but who were fantastic, and had the place wildly leaping about much to everyone’s delight. The band played. The crowd went wild. Really wild. You can see Laura’s photos of Saturday here, some others here, and Mike Grenville’s here. Sunday began with an event that had been (deliberately) shrouded in mystery, apart from the odd teaser about what possible use we might find for 384 blackboards. This extraordinary group process deserves, and will get, a blog post all of its own, but in brief, over the space of 4 hours we built (literally) a high street and local economy for Transition Town Anywhere. We began with the neighbourhoods, identified the key elements of the economy we needed, identified the businesses that we wanted to run, and then built, from cardboard, sticky tape, laughter, newspaper, sticks, determination and string, a local economy. We explored the relationships between the different businesses, what was missing, how it might all work. We had an official opening where our High Street was declared open, which certainly brought a lump to my throat. We held a street party, the ‘Transition Town Anywhere High Street picnic’. People met each other in this world we had created, got lost in it, danced in it, brewed imaginary beer and baked imaginary bread in it, generated energy from their cardboard solar panels. It was utterly magical, a firsthand taste of a new economy, a new way of doing things. As someone said to me during the event, “you could take all the photos of this you like, but you had to be here, this is one that goes in here (tapping his heart)”. Several people I spoke to afterwards became very misty around the eyes just at the mention of it. Amazing. As I said though, I will write this up in more detail later (although you can hear the audio here and watch a lovely slideshow of Laura Whitehead’s images from the event here). 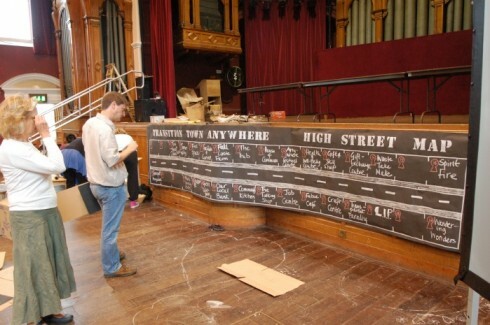 After our street party picnic, the High Street was dismantled and the hall put back together for the final session. This began with people in their Home Groups reflecting on how the event was for them, followed by a go-round for feedback and comments on how the event had been for people, which you can hear here. One of the most stimulating suggestions made was that, given that Transition is clearly now an international movement, should next year’s be outside the UK? A fascinating question, one to ponder over coming months. Part of the closing circle. It was a very positive session, which captured what a powerful event it had been for everyone. Then Sophy Banks offered her closing thoughts on her experience of the weekend, I gave some closing thoughts, and then Peter Lipman wrapped up. Audio of all three talks is here. We then watched Paul Birch’s wonderful short slideshow ‘This was your conference’ which combined music, images from the conference and snippets from overheard conversations. 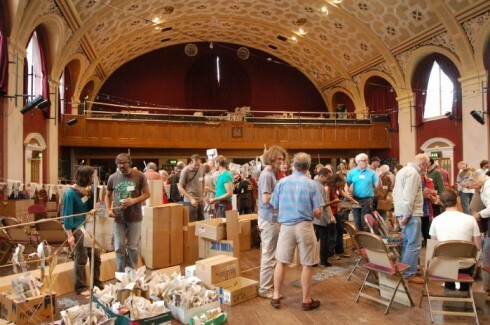 The 2012 Transition Network conference closed with a group song led by Inez Aponte and then slowly people headed off, and some stayed behind to tidy up, as captured in Mark Watson’s blog about the sweeping of the hall. 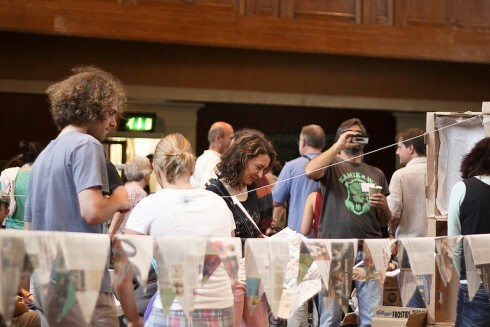 You can see Mike Grenville’s photos of Sunday here, Chris Croome’s here and Laura Whitehead’s here. Personally, I think this was the richest, most complete, and most powerful conference we have yet run. Certainly as the team that holds these conferences grows larger, and more experienced, the depth of what it is able to hold deepens by the year. 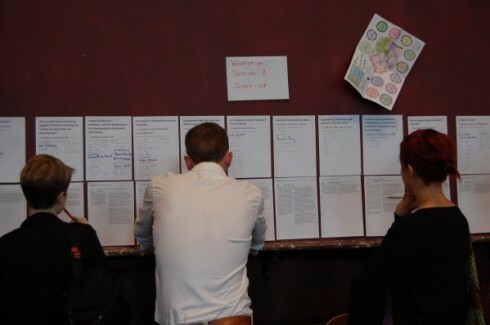 The workshops reflected the maturity of where Transition has got to over its six short years, the High Street activity was just extraordinary, showing the magic that can be weaved with the right facilitation, and the whole place fizzed with discussion, conversation and insight. I struggle for words to describe what amazing event this is every year. It went to places that you really had to be there to experience. 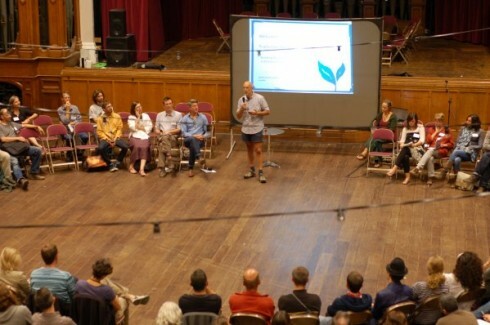 Thanks to everyone who came and made it the event it was, to the fabulous team who held it so wonderfully, to the people at Battersea Arts Centre who were the perfect hosts, and to everyone who came to run workshops. The conference described above was then followed by a 2 day meeting of the international Transition hubs. So, there is an archive of audio here, and a slideshow of images from the whole conference here. Keep an eye on the Social Reporters pages, as over the next 2 weeks, various people will be posting their reflections on the conference. Thanks to Mike, Chris and Laura for the photos. We’ll keep updating it until it’s all there, so feel free to revisit the page over the coming week. Still loads of great video to add. Well done TT Network for organising a wonderful conference. I had great time meeting people from all over the UK, Europe and the world. 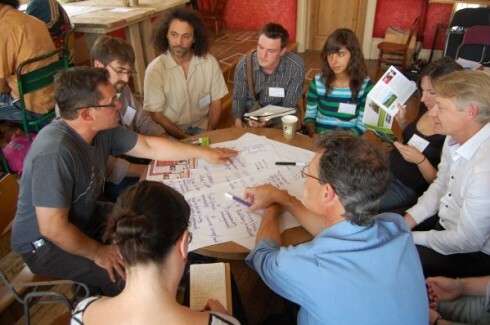 I really enjoyed the Energy Workshop and the Workshop on Localism. All very inspiring and gave me a great boost of energy. I will be passing on my bag of ‘Great British Beans’ to fellow TT’s in Lewes. I think the 2013 conference should become more localised and globalised both at the same time by being held in every country simultaneously hosted by national hubs or key local initiatives. The technology is there. Perhaps there’s a reason why this hasn’t been done previously? Local organisers do need adequate notice to be able to engage their local Transition Initiatives and funders etc. For 2014 I think we should localise and globalise further but also collaborate and connect up further. We would have to start planning soon for this idea to work but the idea would be for the event to be held at a local Transition Initiative/community level rather than the national level but also try to link up with others like 350.org, earthday, international coops and many other orgs and movements and try to do varying event/activities on one day directly in each of our communities. Annual simultaneous events like this have been happening for a while. I remember being involved in some of the early global Earth Dance parties in the 90’s. You might ask, why engage in this type of event now? The time is right as we’re nearing a socio-economic tipping point. There’s a changing reality and new level of ‘readiness’. In my mind one of the reasons that the high street session was a success was because the time was right as the process was grounded in reality; participants could see that there are really enterprises like those on our high street. This type of growing new reality and readiness is happening all over the globe. For example, if we focus our collective experience (i.e. the high street but different) around showing, in huge diversity of ways, the power of working together; There are already nearly 3 billion people dependant on coops for their livelihoods. We are experiencing a massive upsurge of online opensource collaboration. There is already an explosion of new and diverse structures, techniques and ways of working together on and offline. But despite these physical factors awakening this sleeping giant is, in my view, a physiological process. Much like the one some people would have experienced during the high street session, it’s a process of changing the story we tell ourselves, the stories we believe. Can we do it? I have no real doubt. It was only a short while ago, in the 2010 conference, that i saw transitioners feeling a collective economic despair after Stoneleigh’s presentation. We have come so far in 2 years in redefining our story. Makes you wonder were we’ll be in 2 years from now? Wonderful experience ! Thanks ! The Kerry Lane link does not work. A wonderful event, thanks all. I trust you’ll come good on your promise to make sure the compost toilet poem from Saturday night gets typed up and circulated! Who did the music for the closing video? Was it the TTBrazilians? Thanks again and well done TT Network and see you next year. Look forward to TTTV on the web. I believe you are right,Shane. Your proposal has clarity and vision. I’d like to know if TT lifted the expression “head, heart, and hand” from Rudolf Steiner and his Waldorf School movement. Hi Larry, No it’s not. It was an amazing conference! It’s so great to meet and see the world doing transition! Thank you for this fantastic experience! warm and best wishes for all! Chris, the music is from Brazil but is a version in another language! I suppose it was an interesting experience to get there!